Langerhans cell histiocytosis (LCH) is a rare disease characterized by clonal neoplastic proliferation of Langerhans cells, with typical expression of CD1a, S100 protein, and langerin  . Gastrointestinal involvement is extremely rare and usually observed in systemic illness with poor prognosis and high morbidity   . Here, we report the case of a 48-year old man affected by mucocutaneous Langerhans disease, presenting with severe weight loss, constipation, and nausea. He was previously diagnosed with LCH with pituitary localization in 2002 and underwent treatment with vinblastine, steroids, and mercaptopurine. An esophagogastroduodenoscopy was unremarkable, including duodenal and gastric biopsies. Ileocolonoscopy was performed using a high definition colonoscope with optical enhancement (OE mode) virtual chromoendoscopy (Optivista EPK-i7010 video processor; Pentax, Tokyo, Japan) . During withdrawal, the OE mode 2 was activated to increase the detection of subtle mucosal changes, revealing multiple yellowish nodules of 5 – 10 mm in size, with central erosions or aphthous ulcers ([Video 1]). OE mode 1 showed both the pit and vascular patterns to be clearly characterized as nonadenomatous (Kudo II) and irregular or interrupted ([Fig. 1], [Video 1]). Video 1 Ileocolonoscopy showing multiple sites of Langerhans cell histiocytosis with high definition optical enhancement (OE mode) chromoendoscopy. 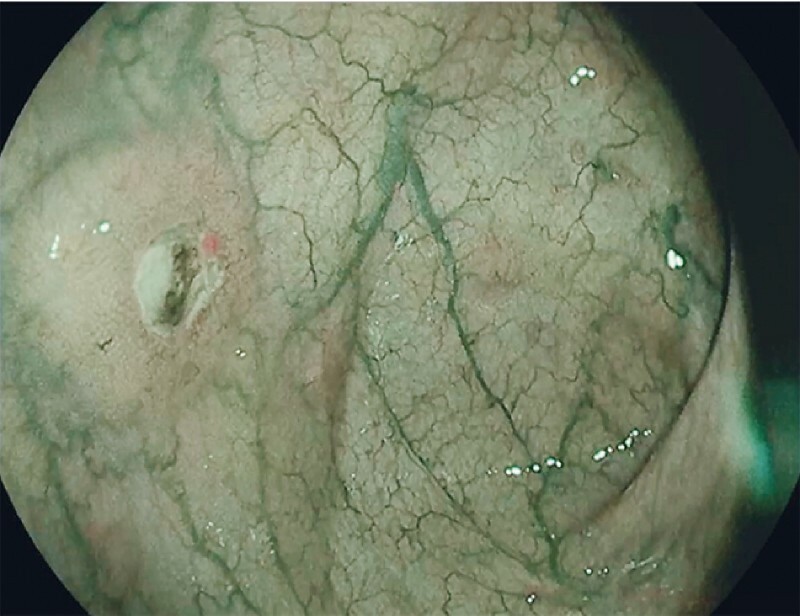 OE1 – 2 mode showed detailed image of a nodule with nonadenomatous pit pattern (Kudo II), interrupted vascular pattern, and aphthous ulcer. Fig. 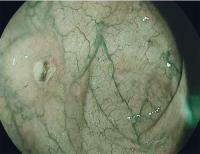 1 High definition endoscopic image with optical enhancement (OE) mode 1, showing a nodule of 8 mm with nonadenomatous pit pattern (Kudo II), interrupted vascular pattern, and central aphthous ulcer. 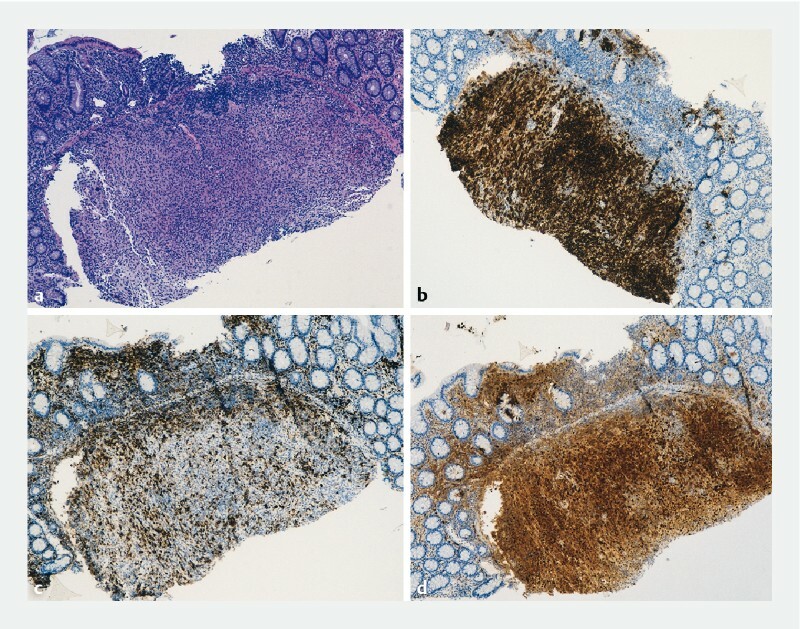 Histology on targeted biopsy samples demonstrated submucosal proliferation of histiocytes, with abundant eosinophilic cytoplasm, positive anti-CD1a, anti-CD68 R, and S100 protein immunohistochemistry, which are pathognomonic for colonic localization of LCH ([Fig. 2]). Fig. 2 Histology of targeted endoscopic biopsies. a Hematoxylin and eosin stain. 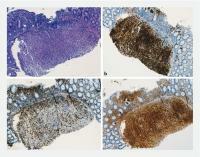 Diagnostic immunohistochemistry: b anti-CD1a; c anti-CD68R; d S100 protein. This case is relevant for several reasons. First, we describe an unusual case of gastrointestinal LCH, which unconventionally manifested with symptoms that warranted endoscopic investigations. In addition, we provide for the first time detailed video and image documentation of intestinal LCH to further support clinicians and endoscopists during their everyday practice.